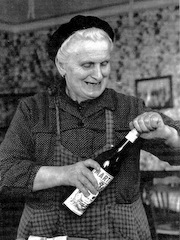 In the early thirties, a young bride from Paris settled in Aviernoz, a small village in the Alps, and opened a café‑bistro. This anecdote is not even remotely interesting if it were not for the fact that this woman became a very active member of the French Resistance. “Camélia” (her nom de geurre) was a “pacifist” for all concerned while she secretly dealt with coded messages, provided food for the partisans heading to the Plateau des Glières, and hid American pilots while helping them to escape to Switzerland. Falling in love with this part of France, Roger and Suzanne bought the property in 1989, and despite having been closed for many years, it still had charm and enormous possibilities. The entire historic building had to be gutted and reduced to its shell before the renovations, using local “artisans”, could be started. The official opening was in July 1992, and was christened Auberge Camelia in honor of the brave woman who saved so many lives while risking her own. “The militia came often”, recalls one of her sons, “everybody knew something was up, but no-one talked”. There were times when she had to burn messages over the fire, and if only these walls could talk, we would know a great number of stories. 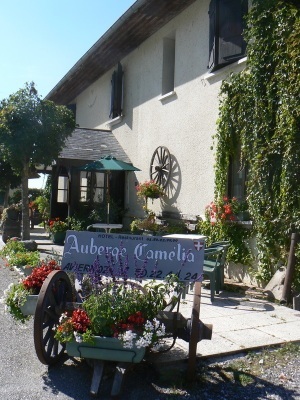 Hotel Auberge Camelia is home to Roger, Suzanne and the hotel dogs – Django Reinhardt and Nolla. When you stay here you become part of that family, enjoying not only the hospitality and comfort, but the history of the place as well. Text courtesy of Denyse Betts.